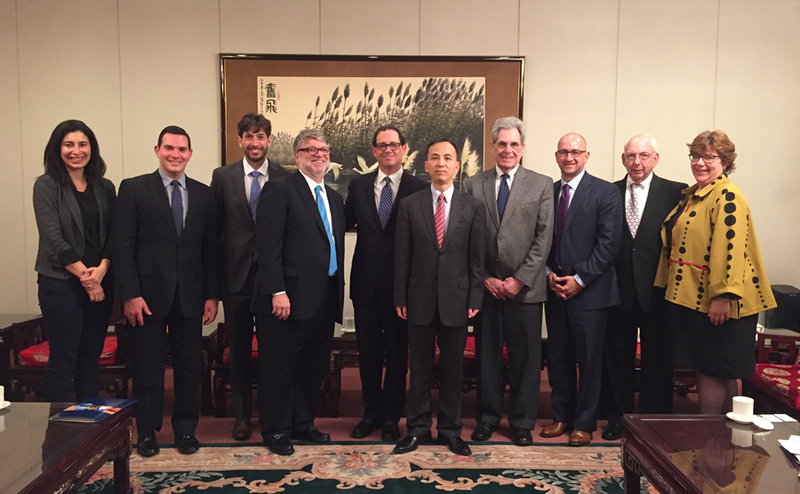 On October 26, Deputy Consul General Liu Jun met with Vice President Seth Gould of the AJC Midwest regional office and other board members. Seth Gould said that the delegation, made up by members from AJC Midwest offices in Chicago, Detroit, St. Louis, Cleveland, etc., came to Chicago for the Diplomatic Marathon Campaign. China has played an important role in international and regional affairs. This year marks the 25th anniversary of the establishment of diplomatic ties between China and Israel. The AJC would like to keep working with China to promote US-China and Israel-China relations. Liu Jun welcomed the delegation, saying that this kind of exchange will help us better understand each other. China is dedicated to building a new type of international relations featuring mutual-respect, justice, fairness, and win-win cooperation. China will always contribute to world peace and constantly commit itself to playing a more important role in international affairs. The two sides also exchanged views on issues of common interest.